B2B is a very well-known term, but how many services do you make use of that are designed specifically for this sector? In this article, I want to share with you two very important B2B services that will help you generate sales without spending more for marketing campaigns and large sales teams. I’m not just going to give you a list of these services, but also explain how it can help you by using the real-life case study of Bharat Rasayan Project of SECO Warwick Allied Pvt. Ltd.
Yomillio is really grateful to Mr. S. Murugaselvan, project manager of M/s Allied Furnaces Pvt. Ltd., a subsidiary of Seco Warwick Allied Pvt. Ltd., for taking the time to explain the project and providing appropriate details for this article. Visibility of your product or service is a must for a small business to stand out and reach its customers. But it’s hard for MSMEs to bear the cost of the marketing required to gain this visibility. For a B2B firm, the solution is networking within groups where you get to meet other business owners and company executives who are your target customers. Social media platforms offer plenty of such free networking opportunities. For example, TAMILNADU WHOLESALE BAZAR is a free group in Facebook where products or services are sold at wholesale prices, mainly to resellers and distributors. Similarly, you can showcase your product or service through LinkedIn groups, Twitter lists, and even a video on Youtube that will increase your visibility and make your business and product known to a whole lot of business owners and decision makers who don’t visit your website. You also need to attend industry events and fairs in person. It will help in building your network and make you a known entity to all the potential customers you meet at these events. Sales is the lifeblood that keeps your business moving forward by generating the revenue you need to meet your existing costs and overheads, and also fuel your growth related expenses. But what is your marketing strategy for generating leads, and then your sales process for converting these leads into paying customers? Using this process, how much does it cost you to acquire each customer? What is the cost of customer acquisition (CAC), for each new customer you get? It varies depending on the costs of your marketing campaign, and the number of sales touches needed. On the other hand, you spend nothing on doubling that sales figure by targeting new orders from existing customers. Your time is no doubt valuable, and you can figure out how much it means in rupees. But the key point here is that you didn’t pay anything to get these leads. Once you have a list of satisfied clients, it assures you a steady pipeline of leads and new orders from them at no cost. This will increase your net profit and help you reach the breakeven point faster. Case Study:- Purchase order to Mahesh Traders from Allied Furnaces Pvt. Ltd. was placed for M/S Bolt with nut & washer in different specifications for their Bharat Rasayan project. Quality maintenance – Quality plays a vital role when working on a project the client ensures that you are capable and worthy in completing the project. The weekly inspection will be held in order to check that you are marching towards the desired output. This ensures less wastage of resources and time effectiveness. This will also help us to understand the requirement even better and deliver the perfect product or service. Example:- SECO Warwick Allied Pvt. Ltd. performs a weekly quality check by dedicated quality control team. 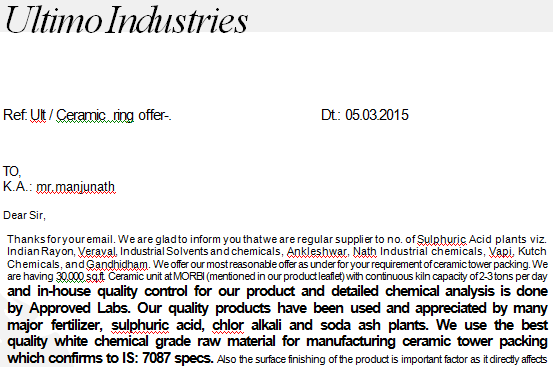 Kindly take a look on the tender placed by Ultimo industries to SECO Warwick Allied Pvt. Ltd. for 2” ceramic ring clearly specifying their quality control mechanism. To conclude, Yomillio can provide you sales leads for orders that you are fully capable of fulfilling. We can facilitate your online connections to buyers, and help you take it forward through in-person networking events. You are then free to focus on what you do best – completing orders and keeping your customers happy with a competitive price, quality, and on-time delivery or turnaround.